It’s no secret that a home with beautiful flooring makes an impression on potential home buyers. My clients will tell me “I love this floor but I’m worried someone won’t like this floor when I try and sell the house”. Flooring trends are changing rapidly with advancing technology in textures, structures, and a race to wider-longer planks. It can be difficult for even flooring professionals to keep up with all the changes. So what’s the right answer for balancing a flooring you love with flooring which will hold the highest long-term value? Before considering what other people might like about your home, you have to first ask yourself the most important question. “When do I plan to sell my home?” Be realistic about this one; the answer might be within the next year or after my kids are off to college. If your answer is within the next year, this will put more importance on selecting a flooring which is trendy and stylish. Trendy colors and styles can breathe new life into an old home, giving the home more appeal to buyers who are exposed to changing design trends in magazines and online. For tips on trendy home designs, Houzz.com is a great resource. On the other hand, if you do not plan to sell your home for 3+ years, it is nearly impossible to predict where new flooring technology and design trends will take us. It might be best to aim for a more conservative approach and select timeless classics and natural colors. Whatever style you select, it will be important to consider all the other aspects of your space. I always say any floor can look good in the right context. The difficult part is finding the right pieces for the puzzle. 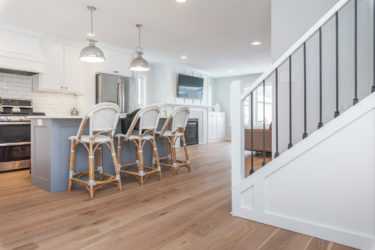 The number one most important aspect of selecting the right floor is to consider other woodwork such as baseboards, cabinets, and irreplaceable furniture. These things are costly to change and directly touching your flooring. Next, you may want to consider countertops, paint, and backsplash. While some of these are still costly to change, they offer a degree of separation with other materials in between. Should I match my cabinets or not? The flooring does not always have to match the woodwork. In fact, designers often aim to provide a stark contrast between the flooring and woodwork to give the area more defining features. Remember color is not the only thing that can have contrast, nowadays you often see minimalist designs with clean lines mixed with rustic high texture high character hardwood flooring. The combination of these aspects produces amazing results. Work with your designer to achieve the perfect look for your needs. When selling your home it’s important to visualize a potential buyer. Is it an urban, suburban, or rural location? Are you targeting newlyweds or retirees? A young couple looking to buy a condo downtown has very different taste than empty nesters looking to retire on a farmhouse ranch. Young urban home buyers are interested in wider planks, neutral tones, and high durability. Older home buyers may take a more conservative route with traditional timeless beauties such as Black Walnut, Brazilian Cherry, or Hickory. After you have a clear vision of your target audience, this will help you select the right floor for maximizing resale. Have a question for coming up with a Buyer Persona? Unique Wood Floors is a flooring company specializing in retail flooring options, give us a call today or tell us about your project online.